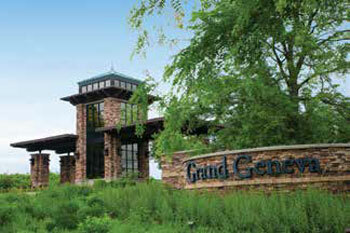 The 2019 Annual Meeting will be held at the Grand Geneva in Lake Geneva, Wisconsin from June 13th – 15th. Take advantage of this opportunity to make your reservations for lodging early. Rates for 2019 are $189 for single or double occupancy, plus resort fee and tax. A deposit of first night's lodging is required. Check-in after 4:00 p.m. and check-out before 11:00 a.m. Reservations may be made either by phone or online. To make reservations by phone, please call 855.833.5345 and reference reservation code #76s3q8 or indicate you are attending the Illinois State Bar Association's Annual Meeting. The deadline for making reservations for lodging is on or before May 13, 2019. Reservations received after this date will be subject to availability. The deposit will be forfeited for all no-shows, early departures and cancellations less than 7 days prior to arrival. Rates - $189 a one bedroom suite (includes 4 water park passes) and $289 for a two bedroom suite (includes 6 water park passes), based on single or double occupancy and subject to the resort fee and tax. Watch in the coming months for additional details, schedule of events and registration information here and in Illinois Lawyer Now. Please note: For Annual and Midyear Meetings, the Association is required to reserve a significant block of guest rooms at the headquarter hotel(s) as well as guarantee that members will use a large percentage of the reserved rooms. If we fail to use the contracted number of guest rooms, we pay a penalty. As a result, members who will be requesting reimbursement of expenses in conjunction with these meetings, must stay at the headquarter hotel. In the event the room block sells out, members having to seek alternate arrangements will be eligible to seek reimbursement, provided the alternate reservation was secured after the headquarter hotel sold out. As outlined in the Reimbursement Policy, the approved rate of reimbursement for lodging is 90% of the actual not to exceed $180. View the Reimbursement Policy in its entirety.